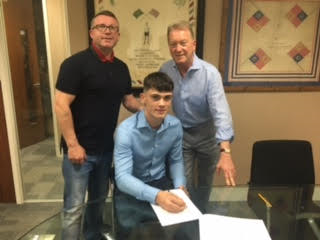 Frank Warren is delighted to announce the signing of highly-rated Tamworth Light-Heavyweight prospect Ryan Hatton. Hatton, a Loughborough University Sports Science graduate, enjoyed a glittering amateur career, winning 50 of his 60 bouts in the unpaid code and picking up six National titles at Heavyweight and two Great Britain Gold medals, as well as captaining his country. 21-year-old Hatton is trained by Tom Chaney at the Hall Green ABC in Birmingham alongside British Middleweight Champion Tommy Langford. “I’m thrilled to have signed my first professional contract with Hall of Fame promoter Frank Warren,” said Hatton. “I have a solid amateur background and I feel now is the perfect time to begin my journey in the pro ranks. “I have a brilliant team behind me and I can’t wait to make my professional debut later this year. Tom Chaney is one of the best coaches in the country and I’m very fortunate to have him in my corner. “The Hall Green ABC is an excellent gym to be a part of and I learn a lot from Tommy Langford about training drills and making weight, he is very knowledgeable. I learnt my trade at the Tamworth Boxing Club with my coach Alan Keast and my dad Tim Hatton, I owe a lot to the both of them. “Frank is known around the World for building young fighters up and getting them the right fights at the right time. Boxing has been my life since I was a kid and the ultimate dream is to win a World title one day. For now it is about taking each fight as it comes and winning in style – I want to entertain! WATCH RYAN’S FIRST INTERVIEW WITH BOXNATION HERE!